Tag Archive | "Walking Tour"
For Part 1 of the Old San Juan Walking Tour, click here. We’ve already seen Old San Juan’s southwestern quarter and it’s host of plazas and monuments. As we travel towards the city’s northern coast we will find all sorts of specialized museums, historical buildings, streets lined with bars and restaurants, and, of course, the island’s most visited site. So let’s continue with the second part of our Walking Tour, shall we? By now you’ve soaked up all the spectacular views from Plazuela de La Rogativa and you’re feeling refreshed and energized to continue with your exploration of the city. Head north on Calle Las Monjas (past La Rogativa to your left and past a white-columned gate) and you will find Casa Rosa (Walking Tour sight #10). Literally meaning “pink house”, the distinctive building was used as a garrison during the Spanish colonial period but now serves as a daycare center. Continuing the tree-laden path north leads to the open expanse of El Morro’s field. But before we reach the fortress, you’ll find another point of interest to our right: la Escuela de Artes Plasticas (#11). Formerly an insane asylum, this historic building, a prime location for inspiration and beauty, currently houses the premiere school for arts in Puerto Rico. After meandering around the school (you never know if you might witness some sort of divine inspiration going on) we’re ready to tackle the big one – Fuerte San Felipe del Morro (#12). To reach El Morro just follow the quarter mile path that runs through the open grass field where you might find families enjoying a picnic out in the breezy, sun-drenched space. Kite flying is immensely popular here; the trade winds blasting from the Atlantic and the vastness of the open sky are a perfect medium for this time-honored tradition. The fort of El Morro is without a doubt the most popular destination for visitors to the island, and for good reason. The imposing structure was begun in 1540 but didn’t achieve it’s completed state until several centuries later. As San Juan’s principal defense against attacks by sea, El Morro has served on several occasions as repellent to invasion forces – from the English (1595, 1598 & 1797) and the Dutch (1625) to the Americans (1898). Take your time while exploring the area, history is seeped into the walls of this UNESCO World Heritage Site and the views of the bay and surrounding ocean are a marvel to look at. Adjacent to El Morro is another much-photographed spot in the city, el Cementerio de San Juan (#13). To get there, walk the length of El Morro’s grounds heading east towards Plaza del Quinto Centenario. A road leads down into the surreal atmosphere of the cemetery where ghostly statues and elaborate decorations adorn some of the tombs. Many important Puerto Ricans are buried here: nationalist leader Pedro Albizu Campos, pro-statehood movement founder Jose Celso Barbosa, and poet and politician Jose de Diego. After you’ve taken in the views from the cemetery go up to the street once again. We’ve still have some ground to cover and much more to see. Norzagaray Street, due east, lands us on our next stop, Museo de San Juan (#14). Dedicated to the preservation of the city’s history, the museum is the ideal place to learn all about your surroundings during your stay in Old San Juan. Included in the displays are works from Puerto Rican masters Jose Campeche and Francisco Oller. After you’ve caught up a bit with the culture, it’s time to discover another aspect of it first-hand. To the south of Museo de San Juan we enter Calle San Sebastian (#15), a favorite hangout spot for locals and tourists. The street is famous for the festival held every January, when hundreds of thousands of visitors flock to San Juan to experience the festivities first-hand. But San Sebastián St. is active year-round with plenty of restaurants and bars inviting patrons to take a load off, if only for a little while. Have a drink or order up some food if you like, but we still have 3 more spots to go on this leg of the tour. You’ll have more time to explore the street and have as many drinks as you want afterward – promise! If we go west on San Sebastian Street, we’ll reach it’s intersection with Del Cristo Street. At this juncture we find Plaza San Jose (#16). The plaza is easily recognizable thanks to the statue of Puerto Rico’s first governor, Juan Ponce de Leon, and to the centuries-old church that gives the square it’s name. The shaded benches offer a welcome respite for those in need of it. Fortunately for us, the last 2 spots surround Plaza San Jose. To the right of the statue – perpendicular to the church – is Museo de Casals (#17), dedicated to the life and work of world-famous cellist and composer Pablo Casals. Though born in Spain, Casals has been adopted as an important figure in the development of the fine arts in Puerto Rico. Next to Museo Casals is Museo de Nuestras Raices Africanas (#18). The museum chronicles the rich cultural heritage of West Africa that has contributed to Puerto Rican society. Apart from the fascinating exhibits, the building that houses the museum is also an architecturally significant piece of history. This concludes the second leg of our Walking Tour. Head back to Calle San Sebastian for more cocktails and a proper meal or join us for Part 3, where we’ll explore more historical buildings before heading down Del Cristo Street. There’s a certain mystique to Old San Juan – the historic sector of Puerto Rico’s capital – a timeless aura difficult to describe to people who’ve never experienced the Caribbean’s bona fide international city first-hand. Cobblestone streets and centuries-old architecture mix with the trade winds that blow from the Atlantic, the hustle and bustle of city life, Puerto Rico’s central government, the island’s liveliest nightlife, and some of its best cuisine, making the city a very special place to wander around in. The true charm of Old San Juan lies in exploring every nook and cranny, every oddity, be it by yourself or with love ones. You can find relaxing spots from which to gaze out at the horizon, enjoy the sunset or watch the stars twinkling in the moonlight with ease. Opportunities to discover and take in the history at the heart of Old San Juan open up with every step. Every visit is a chance to explore something new, or rediscover old things and see them in a new light. It happens to everybody, be they residents, visiting locals, expatriates or tourists; the city is magical that way. No matter where you stand, sculptures, plazas, churches, museums and many other places of interest are just around the corner. But where should you start? What exactly do you want to see? “Gosh, I sure hope I don’t miss anything worthwhile” – says the lonely traveler desperate for some, any, direction. Worry not! 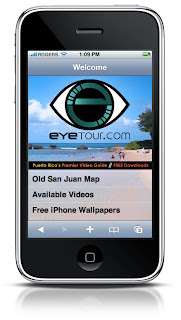 To make your exploration of the Old City a more organized and informative proposition, we gladly present the first installment of EyeTour.com’s Old San Juan Walking Tour. Let us assume, for the purposes of this exercise, that you’re starting off at the Marina (Walking Tour sight #1) in the southern area of Old San Juan. Cruise ships dock at the piers year-round, bringing with them millions of visitors eager to explore the city. The first building you might see just across the street is the Sheraton at Old San Juan and its two restaurants – Chicago Burger Co. and Palio. Several other shops, restaurants and bars are lining the avenue so feel free to explore the area to suit your needs but don’t wander off too far, we’re gonna head west to continue with our (eye)tour. As we continue west towards our second sight, Plaza de la Darsena and La Casita (#2), you might want to make a stop at the corner of Marina and Tanca streets where you will find Casa Don Q. Besides being a museum dedicated to the history of rum production on the island, it also has rum products available for purchase – not to mention the complimentary cocktail at the bar. The same building that houses the Casa Don Q, known as the Edificio Ochoa or Ochoa Building, is the current site for the Puerto Rico Tourist Information Center and the Rums of Puerto Rico Tasting Bar, where you can have another cocktail if you’re so inclined (And no, Puerto Rico is not trying to get you drunk! We just like to share our rum, being the Rum Capital of the world and all…). Across the street from this building you will find the Plaza de la Darsena, a picturesque plaza overlooking San Juan Bay where gently blowing breezes refresh weary travelers (not you, though, we’ve only just begun!). The main structure here is La Casita, which has served time and again as a tourist information center. This plaza is often host to artisans and local vendors, as well as a horse carriage service that takes visitors around the city. Directly to the north of Plaza Darsena is another small plaza – Plaza de Hostos (#3) – named in honor of one of the most important figures in Puerto Rican history, Eugenio Maria de Hostos. The plaza is also oftentimes host to artisans as well as vendors selling fried treats, sandwiches, and refreshments. Particularly popular is the piragua – a perfect way to cool off from the sun’s scorching heat. El Arsenal (#4) is located south of Plaza de Hostos, going down La Puntilla Street, at the southern most tip of Old San Juan. Though previously used for weapons’ storage and as a naval station, El Arsenal is now used for more peaceful purposes, mainly artist showcases and other cultural events. We’re now almost halfway through our first leg of the walking tour. Let’s go back north the same way we came so we can stroll through the most picturesque promenade in all the island – the Paseo de la Princesa! Paseo de la Princesa (#5) is without a doubt one of the signature sights of Old San Juan and the entire island. If we walk west from Plaza de Hostos we’ll be able to enjoy the whole brick boardwalk in all it’s glory. The wide-open space of the promenade lends itself to picture taking or just a pleasant stroll. A cafe/restaurant is shaded by huge trees and palms that line the sidewalk. Further ahead is the headquarters for the Puerto Rico Tourism Company, a refurbished building that was once a prison during the Spanish Colonial era. After walking the length of Paseo La Princesa you will find the Raices fountain, a breathtaking homage to the roots of Puerto Rican culture. Photo ops abound, either of the beautiful fountain sculptures, the surrounding city walls or the unobstructed view of the opening to San Juan harbor. And if you thought the fountain was beautiful during the day, be sure to check it out at night if time permits, when the whole paseo is illuminated by streetlight. Continuing the path northward along the shore we reach La Puerta de San Juan (#6). A relic of the time when the city used to be closed off at night to keep attackers at bay, this entrance is the only one (out of three) left standing. It’s still an imposing sight and it serves as our tour’s gateway into the city proper. At this point, you have two options. Before passing through La Puerta de San Juan, you can continue the trail to the left and walk along La Muralla de la Ciudad (#7) with spectacular views of the bay and the coast on the other side. The path leads directly to the northwestern tip of San Juan, directly below El Morro (even though there is no access to the fort through that path, the unique view of the surroundings is worth the extra effort). If you prefer to bypass the path along the old city walls you can pass through La Puerta de San Juan and cross the street to Museo Felisa Rincon de Gautier (#8). This 300 year-old structure was the original residence of Doña Fela, the first female mayor of a capital city in the Americas. It now displays personal effects and memorabilia pertaining to the life of this beloved politician. Our last stop in the first leg of EyeTour.com’s Old San Juan Walking Tour just happens to be my personal favorite. Across from Doña Fela’s Museum and up a flight of steps is the Plazuela de la Rogativa (#9). Featuring a jaw-dropping view of the surrounding ocean and coast, the 12-foot tall bronze statue is one of the most photographed sculptures in Puerto Rico. As with the Paseo de la Princesa, the awesome view is only magnified when the sun goes down and streetlamps iluminate the area. It is then that the twinkling lights of ships at sea join the stars up above to create an almost ethereal atmosphere. So, you’ve made it this far. Might as well stick around for Part 2 where we’ll visit other places of interest like El Morro, San Cristobal and Capilla del Cristo. What are you waiting for? Continue your exploration of the historic city of Old San Juan by clicking here!